The Grand Turk Post Office on Front Street, Cockburn Town. The Post Office on Grand Turk. 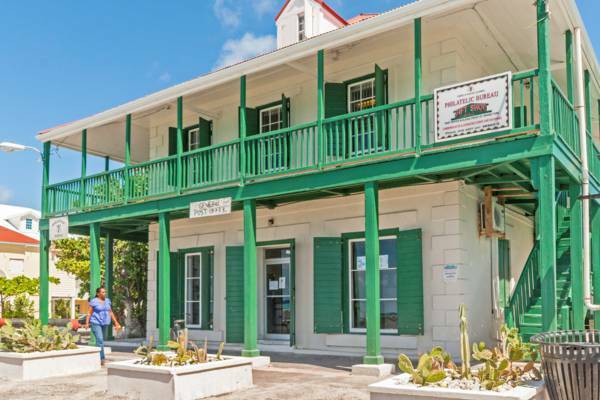 Found on the picturesque Front Street, the Grand Turk Post Office is currently housed in a British Colonial style building in the beachfront region of Cockburn Town. The main office provides basic postal services between 8:00AM and 4:00PM Monday to Thursday, and 8:00AM to 3:30PM on Friday. A small shop is found on the second story of the Grand Turk Post Office. Although the current selection and stocks of this shop is a bit declined from what it was a few years ago, stamps, postcards, Turk and Caicos coins (in the unique “Crown” denomination! ), handmade crafts from the National Trust, and some other miscellaneous trinkets are still available. The Turks and Caicos has had an active history of postage stamp issuance, beginning in 1867 with the one penny red. Modern designs vary greatly, with souvenir sheets commemorating historic events, popular culture, and nature. The cannons and plaza at the Government Offices, Cockburn Town. The Turk and Caicos has had quite a stormy experience with international mail. 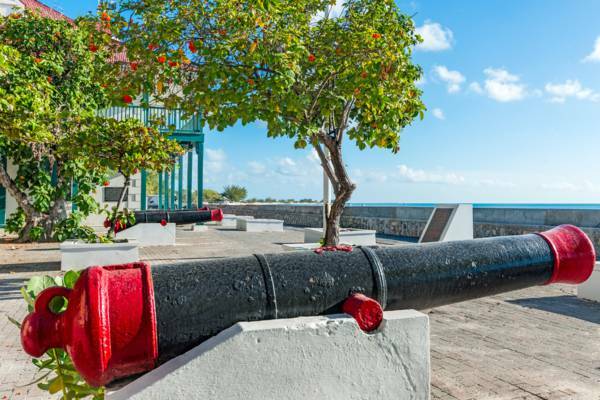 Until well into the 1900s, Grand Turk was the only island in the country with much development and as such was consequently the only island that could claim to have a mail service. After the first British Royal Mail Service ship to be lost at sea, the R.M.S Medina, wrecked on the unforgiving North Reef off of Grand Turk in 1842, the established trans-Atlantic mail routes were changed and the country was no longer a scheduled stop. For a decade all post had to be collected from St. Thomas, 450 miles (730 km) away, on a locally-funded schooner. In 1852, then president Forth established a permanent post office and convinced the authorities in the United Kingdom to re-open a direct mail route. There was a silver lining to the episode though, as the construction of the Grand Turk Lighthouse was largely in response to the R.M.S Medina wreck. As the populations and development of South Caicos, North Caicos and Providenciales increased, they eventually received post office branches as well. It’s easy to find the post office. Simply follow the coastal and one-way Front Street in Cockburn Town. The post office is directly adjacent to a quite obvious small courtyard with prominent 19th century cannons. Three oceanfront streets line Cockburn Town: Duke Street, Queen Street and Front Street. Walking or driving this scenic route is a recommended activity for visitors to the island.